Supporting a big cylinder turns out to be pretty hard. With the boiler shell basically ready to work on, it was time to finally get down to making some parts. The legs seemed like a good place to start, because they are pretty straightforward parts and make for a good way to ease into this hefty project. Little did I know the legs would be such an odyssey! Design iterations and failures abound in this seemingly simple job, so buckle up and witness me. The purpose of the legs is twofold. First, the boiler needs to be off the ground so that the base plate doesn’t get burned (if wood) or rob us of precious heat (if metal). An air gap underneath it acts as an insulator. Second, and more importantly, there needs to be room for fittings on the bottom. Different boiler designs will involve different fittings, but it’s a safe bet there will always be at least a drain valve. Often there is also a blowdown valve (which may be the same as the drain valve) and in our case there’s also part of the sight-glass system for monitoring the water level. In a real stationary boiler, it would be typical for it to be sitting in a built-up cradle made of bricks or cast iron. We’re going make legs because it looks nice and is easy to do (for certain values of “easy”). The design that D.E. Johnson came up with for these legs looks quite attractive and is straightforward to make, so I started out copying what he did verbatim. His design consists of four legs, each attached by a right-angle bracket that attaches with a ferrule through the side of the boiler shell. Here is D.E. Johnson’s design. The bracket has a bushing/ferrule inside the boiler that is screwed to a square piece on the outside, to which the leg is attached. Here’s another look at the legs in Mr. Johnson’s version. Note the square bosses that attach to the boiler. I deviated a bit from that design straight away, because I didn’t care for the square piece that supports the legs. It felt awkward to me amongst all the round details, so I decided to make all these parts round. The ferrules inside the boiler are a straightforward turning operation. 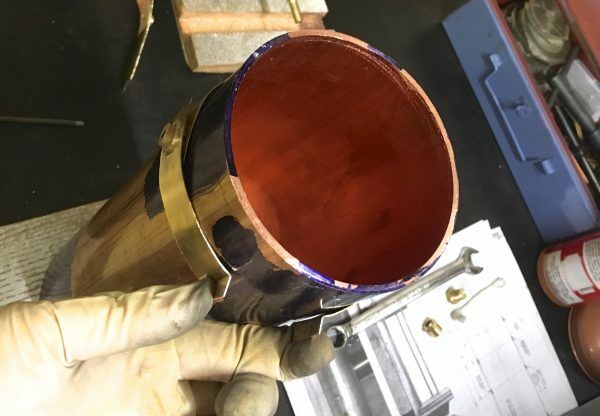 The outside is turned to an arbitrary dimension (not critical), the shoulder is cut to a depth that matches the thickness of the boiler shell, and the center is drilled and tapped 10-24. Repeat three more times, and we have our interior pieces. Next, we need to make the bosses that attach through the shell to those ferrules, and support the legs. As I said earlier, I decided to make them round. I turned the outside to dimension, and drilled the center for clearance for a 10-24 bolt. I also wanted to counterbore for the head of a cap screw, because this looks very nice. 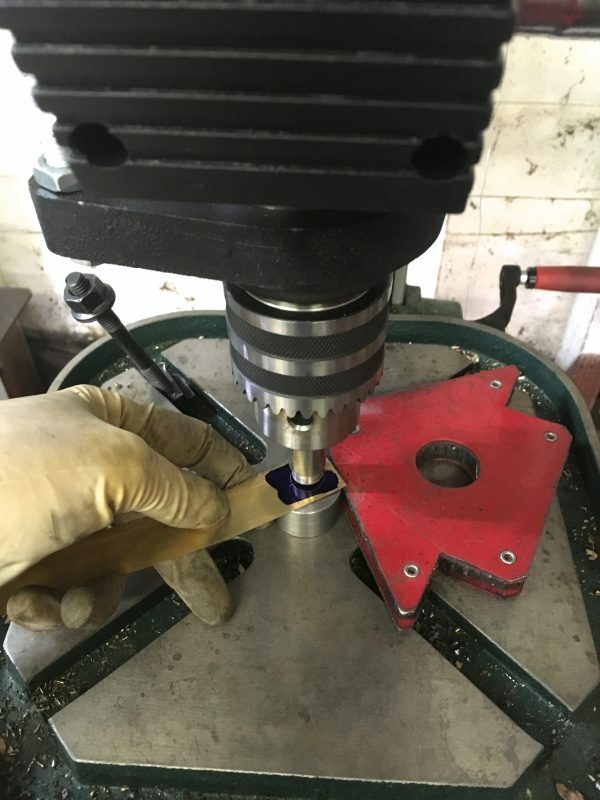 The ideal tool for this would be a counterbore bit, which is designed for the exact job of making a flat bottomed area around the top of a bolt hole. 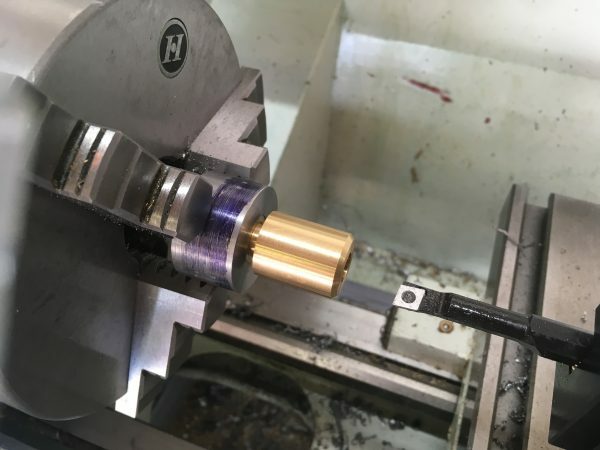 An end mill held in the tailstock chuck would probably also work. Not having any of those things, I used a normal drill bit. You have to calculate the pointy area of the bit and add that to your depth. The shoulder area will be 118° to match the angle of the drill instead of flat, but the bolt head still seats just fine. Three more of those, and we’re almost done with the leg brackets. However, the legs need a flat part to sit on, so it’s back to the four-jaw chuck. I laid out a flat area that would match the width of the top of the legs. I used a circle chord-length chart to determine how deep of a cut would result in a flat area with the width I wanted. Machinists have charts for everything. They’re great- doing the math yourself is a source of error and slows you down, so you might as well just look it up. I then mounted the piece in the four-jaw, making sure it was parallel to the chuck face by running a dial indicator up and down on the cross-slide. 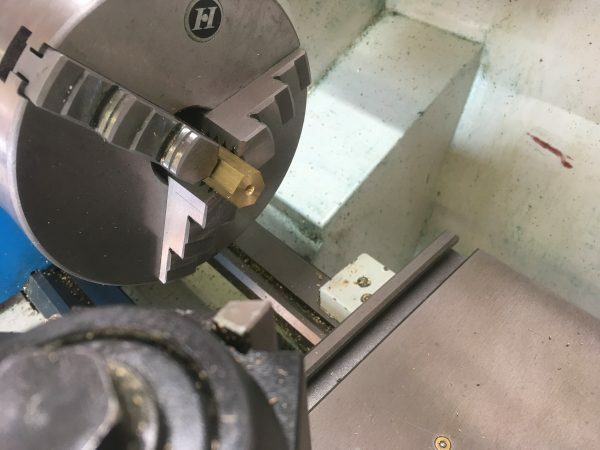 Getting a piece like this to run true on the axis of the chuck is a bit tricky- you basically have to dial it in twice, once for each dimension. This is the same technique used to flatten one side of a cylinder for a wobbler engine. Once flat, I was able to drill and tap 10-24 to receive the stud on the top of the leg. That’s a shop-made spring-loaded tap follower, and it makes jobs like this so much easier. I didn’t blog the making of that tap follower, but if you’d like to see a post on it, let me know. Repeat three more times and we have our leg brackets! So far so good. Next up are the legs themselves. These are made from hex stock, mainly for appearance. Hex stock is a lot of fun to work with, and we’ll be doing a lot more of it on this project. You can get very attractive and functional parts by turning down sections of the hex to varying degrees of roundness. You also get attractive effects with chamfering and filleting tools on hexagonal profiles. The one trick with hex stock is that it is difficult to get concentricity with it. 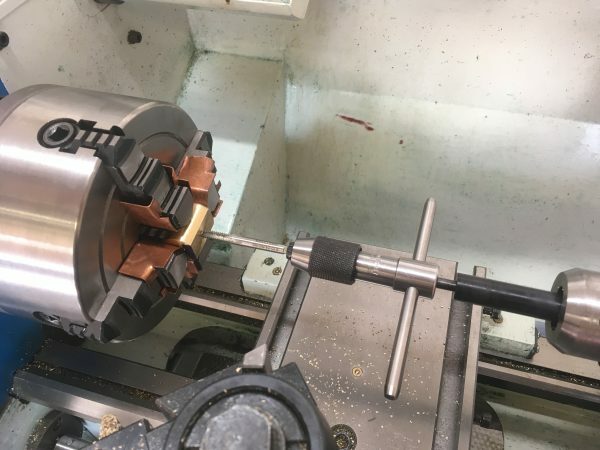 If you use the three-jaw chuck, it’s easy to hold, but you’re at the mercy of how true the stock is. Since you have to preserve part of the original surface (otherwise why would you be using hex stock), you lose the ability to “cut below the run-out”. 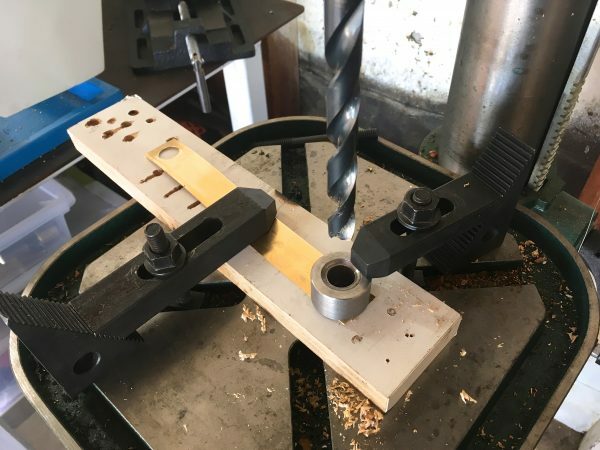 You can set up hex stock in a four-jaw chuck, but dialing it in is really tricky, and two of the jaws are holding on corners, which is awkward and not very rigid. 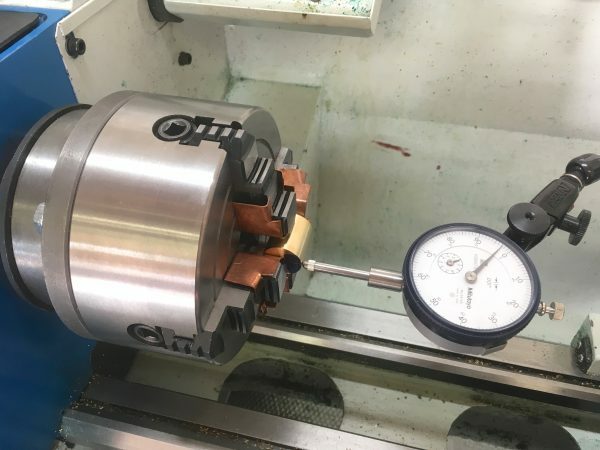 The ideal chuck is an independent six-jaw, but those are hardly common in weekend-warrior machine shops. The bottom line is, don’t use hex stock for something that needs good concentricity. This is rarely a problem in any case, because if you’re using it, you’re probably making bolts, plumbing fittings, or decorative elements. None of those need crazy high concentricity, typically. 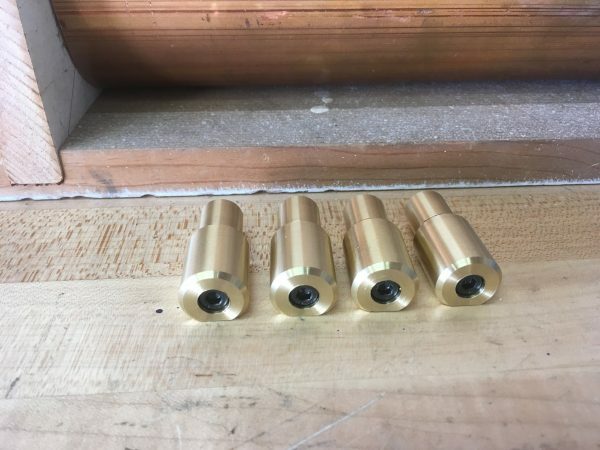 For the legs, the ends are faced and drilled/tapped 10-24. The center portion of the leg is then turned round to create a nice aesthetic. 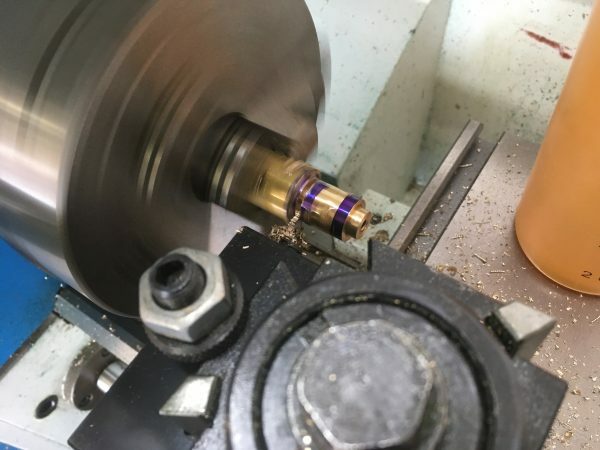 This turning was done with a 90° chamfering tool that I ground for the purpose, in order to create symmetrical transitions from round to hex at each end. Note that parting off hex stock can be slightly alarming. It’s a very interrupted cut, and parting blades do not appreciate being treated that way. Very low RPM and gentle feed are the rule until you get deep enough to have a continuous cut. It will sound like a little baby power hammer until then. Here’s the complete assembly for one leg. Repeat three more times, and we have all our leg parts! I was pretty pleased with myself at this point, but a dark cloud was coming. Over the course of many showers and commutes, I was thinking about this leg system and decided it had a critical flaw that I really didn’t like- it requires cutting gratuitous holes in the boiler shell. 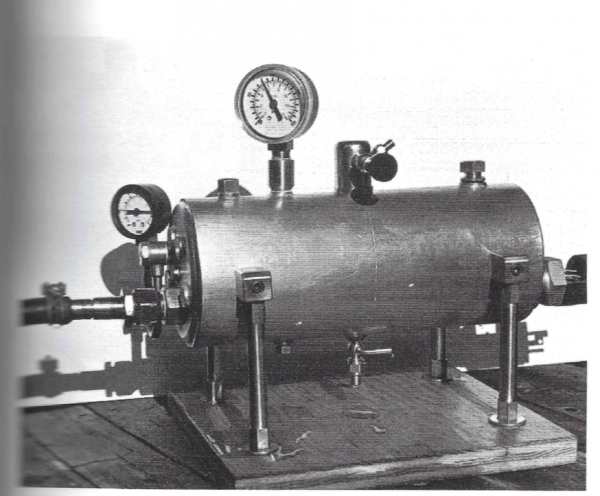 This is a pressure vessel, and every braze joint that we subject it to is a potential point of failure. I’m also not a particularly good brazer-person. So why would I ask for trouble by using a leg system that demands four extra pointless holes to be made? I couldn’t bring myself to do it. Instead, I decided to head off the ranch and do something different. All the ideas I had revolved around some sort of clamping-band system that would wrap the boiler and hold it like you might support a pipe in a ceiling. My idea was to have a continuous band over the top, to which one pair of legs attach. The bottom clamp would be two pieces, attached to the legs, but with a gap at the bottom. This gap would be bridged by a bolt that can be tightened to get the clamping action. The bottom clamp would squeeze the boiler upwards into the top clamp, securing it firmly. 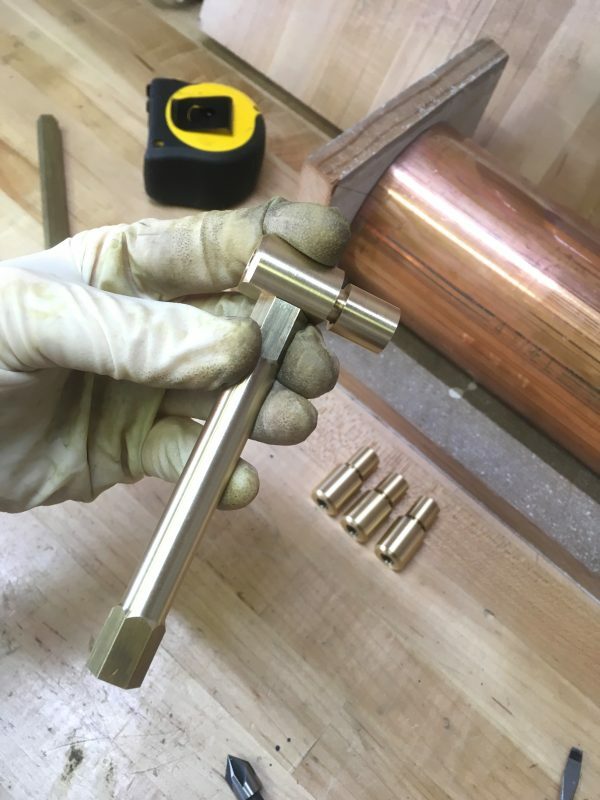 I decided to reuse the ferrules that are supposed to go through the boiler, and instead braze them to the bands that wrap around the boiler. This way, the bands would sit flush all the way around, which would be quite attractive, and the legs still screw in as before. I started by shortening the ferrules I had made to something much thinner, to keep the legs roughly the same width apart. 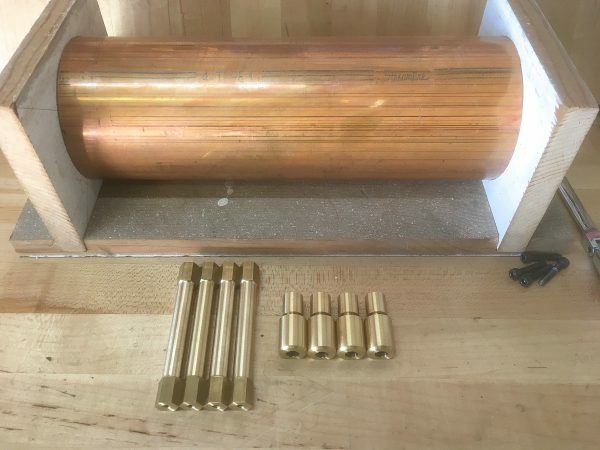 To make the bands themselves, I fished some 24ga brass sheet off the junk pile. Now, I knew I had a challenge ahead. Sheetmetal work is one of those things where, if you have the right tools, it’s easy and pleasant. If you don’t have the right tools, it’s hell and the result always looks kinda like garbage. I was in the latter camp, but determined to minimize the garbage part. I don’t have a press brake, a shear, seaming pliers, a nibbler, or any of the other things one should use for sheetmetal tasks. I wasn’t about to tool up a whole sheetmetal shop in my laundry room for this one little job though, so let’s see about making due. I used some card stock to lay out the dimensions for the bands. The hole you see is where the ferrule will be brazed into to tie in the legs. I know from previous agony that drilling sheetmetal cleanly is a pain in the patouie. The drill deforms the piece, the piece grabs the bit and twists itself up into knots, cats and dogs live together- it’s terrible. Instead, I thought I’d try my hand at making a punch. 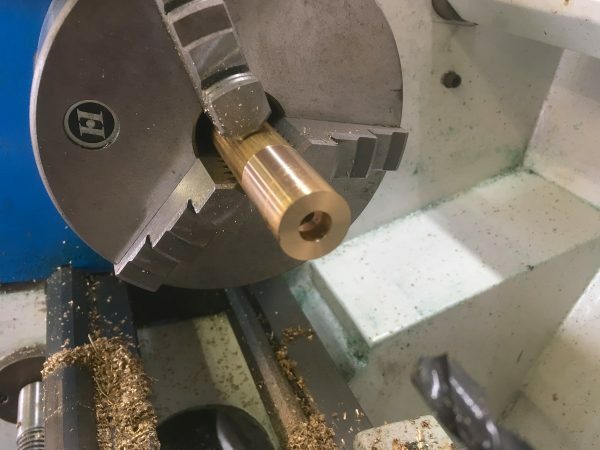 I’ve never made one before, but the tolerances can be looked up and a punch is ultimately just a round thing with a slightly larger round thing for a die. Lathes are great at making round things, and I have a lathe. Onward! The junk pile provided this very convenient piece of scrap that is actually already sort of a punch and die. I turned the protrusion to my punch size, then parted it off. The die part was then faced off and bored to the precise dimension. 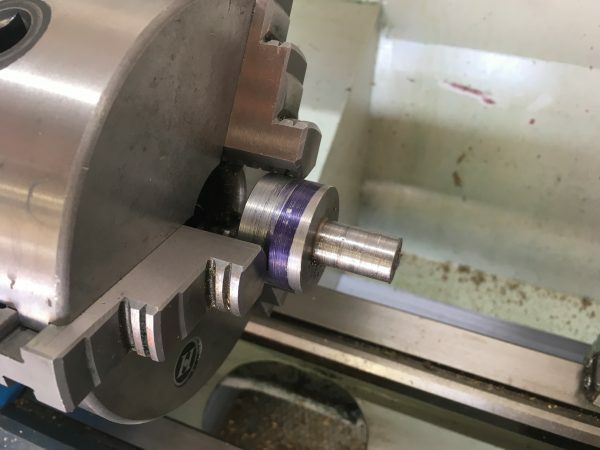 There are tables that tell you the clearance needed between the punch and die depending on the diameter of the hole and the thickness of material you are punching. In my case, it was 3-5 thousandths. 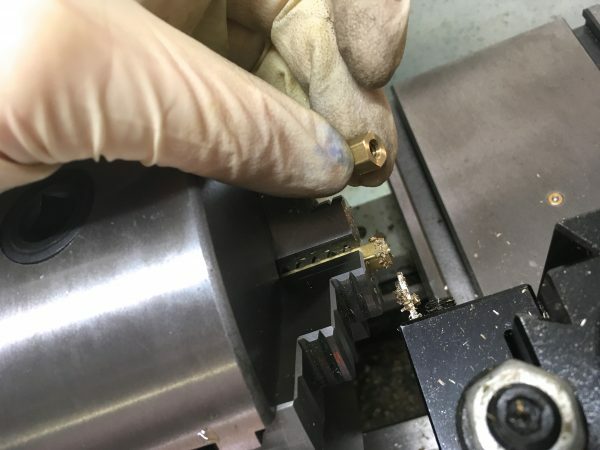 I double-checked my die bore by fitting the leg bracket into it. This is the hole it needs to make, after all! Here’s finished the tool. I tested it on some card stock, and it worked great! 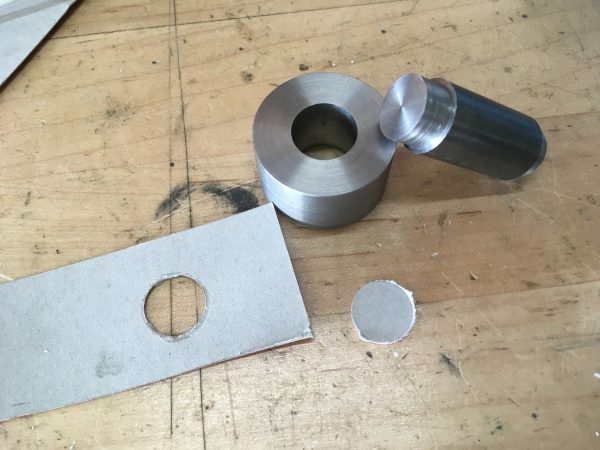 Ideally, a punch like this would be made with tool steel, not mild steel like I’ve done here. However, this will only be used on brass, and only needs to survive for eight holes, so I’m not concerned. Okay, enough theorizing. 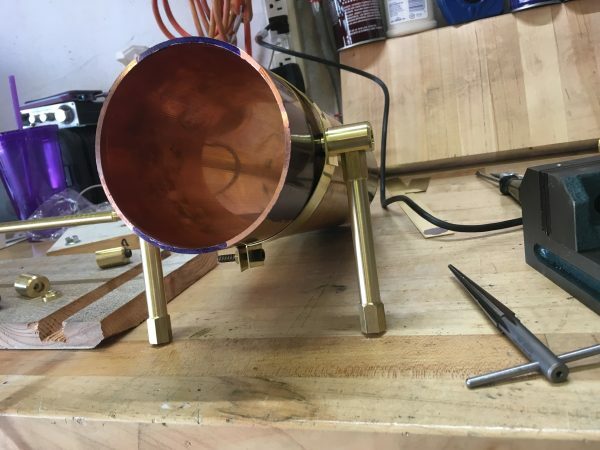 It’s the moment of truth- does it work in actual brass? The first attempt did not go well. The problem is alignment. Since I don’t have an actual press, I’m trying to do this operation by other means. I tried a hammer and the drill press (not good for the drill press! ), but ultimately settled on the bench vise (not great for the vise either). The vise has the clamping force needed, but aligning the tool halves is very difficult. I worked out a few tricks to get the alignment right, and then it did work pretty well! When the alignment is correct, I was actually surprised how little force is required. A perfect fit! I was feeling pretty good about this approach, although getting the alignment correct was still difficult, and my success rate without deforming the area from misaligned attempts was not good. An arbor press went on my Festivus list for next year. In the meantime, we’ll continue to improvise. 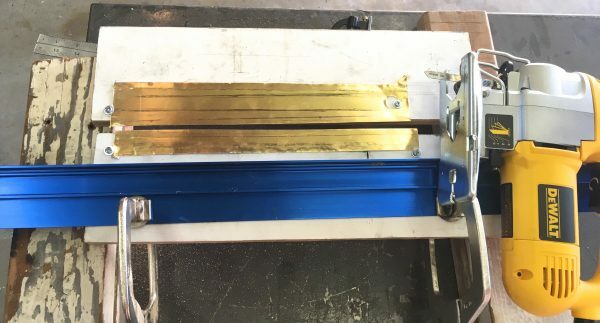 The next challenge was getting nice one-inch-wide strips cut from my brass stock. 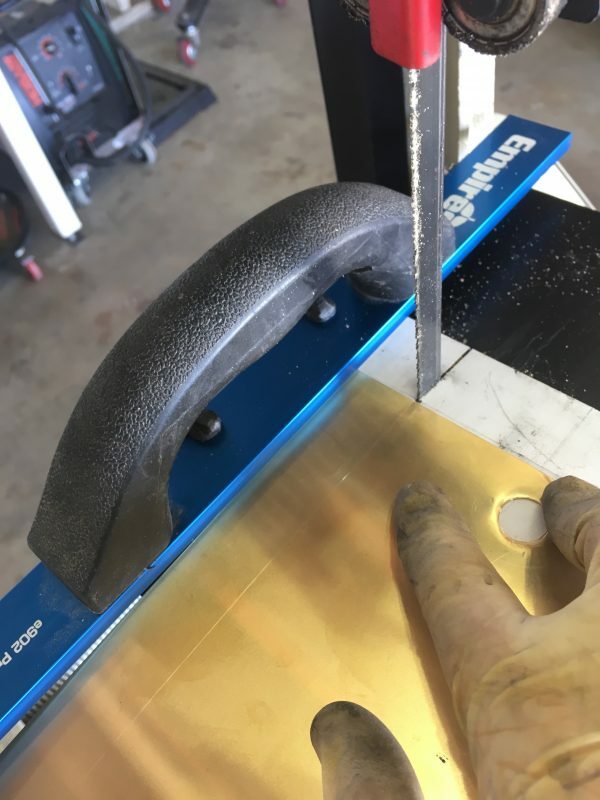 Again, the correct tool for this (a shear) makes this a painless task (as long as you keep your fingers out of said shear) and delivers perfect results. I needed another way. The first thing I tried was the bandsaw. The standard Asian import 4×6 horizontal bandsaw that we all have comes with a terrible little table that lets you set it up as a vertical bandsaw. I’ve used this a few times in a pinch, but it’s not great. In this case, it did cut, but it left a pretty rough edge because the blade I have on there is much too coarse for thin material like this. 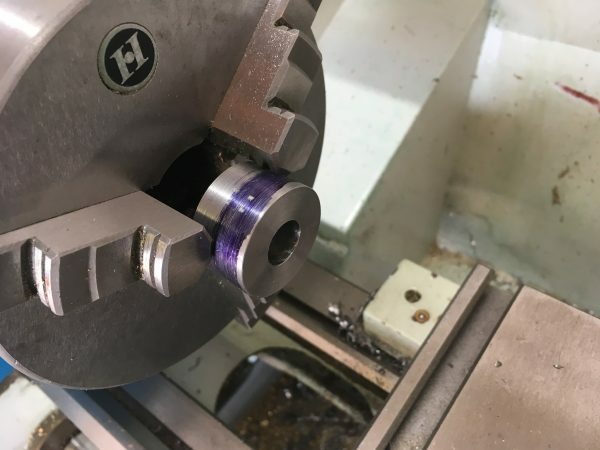 The rule of thumb on bandsaw blades is that three teeth should be inside the material during the cut. For 24ga material, that means you need a very fine-toothed blade. This idea was a no-go. I also tried tin snips, out of desperation, even though I knew it would make a deformed, roughly-cut mess (because tin snips always do). I didn’t bother photographing that train wreck. The one thing I found that worked okay was a jigsaw with a very fine blade. The material has to be well supported and clamped close to the cut on both sides to keep from vibrating and deforming, but the resulting cut is actually fairly decent. With the right clamping (screws and washers into scrap wood, in this case, and a good fence to ensure a straight cut, this does work. It’s very fussy to set up though, and there are still saw marks visible. This is an oh-kay solution, but I didn’t love it. I made four strips with the jigsaw method and set about making some holes. You can see the strips I cut with the jigsaw here, and I’ve marked them for the punch. I went back to using the drill press for this, since it makes alignment trivial, and alignment is everything here. I felt really bad about doing this to my drill press, but the pressure required really isn’t that high if alignment is good and the punch is sharp. When this works, it works pretty well! Here are my four band clamp pieces with holes punched. I really wasn’t very happy with this result. The holes are poorly aligned because of the difficulty of using my punch without a proper press, and the saw-cut edges were bothering me. I decided to press on (pardon the pun). 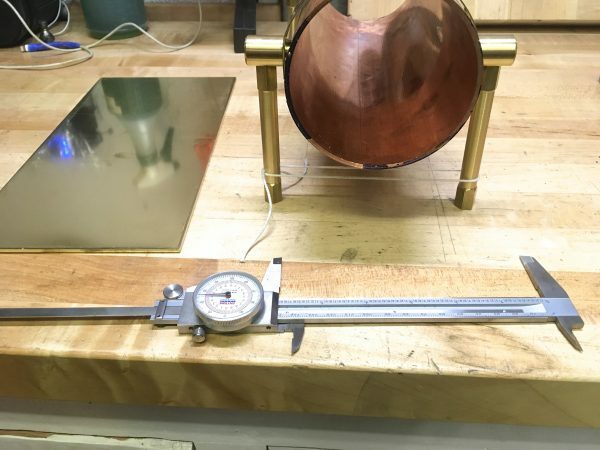 To get the lengths of the band clamps just right, I set up the boiler on the surface plate and marked the “equator” all the way around with a height gage. Surface plate work is super fun and satisfying! With the clamps cut to length and punched, it was time to braze in the bosses. To the fire bricks! The brazing seemed to go pretty well. I had a really good fit for the bosses in the punched holes. It took a few tries on each one, but I did manage to get a seemingly good braze joint all the way around each boss. A test fit of the top band for one end seemed to suggest we were on a successful road. This is the point where things started to go really wrong yet again. I trimmed the halves of the bottom clamping section, but they were too short. A bolt had no hope of spanning that gap. I should have measured three times and cut once. To make matters worse, while fitting the bottom clamp, all my braze joints to the ferrules on the top clamp started cracking and failing. 24ga sheet just wasn’t enough cross-sectional area for a secure braze, and the joints gave up the ghost under very little provocation. Recall also that I wasn’t happy with the pieces made thus far- misaligned holes, saw cut marks, etc. Everything was just sub-par overall. I had used up all my brass sheet stock in all these various failed attempts at cutting, punching, brazing, etc. Each step in the process failed multiple times, and that’s usually a sign that the whole enterprise is on the wrong strategy. It was time for a stop-and-think, as my mom used to say. I decided to start over with a different approach. I would not rely on brazing- the ferrules would clamp through the bands with screws. That would mean the clamps would have a sort of oblate-sphereoid shape to them, but the system would be secure, reliable, and easy to make. 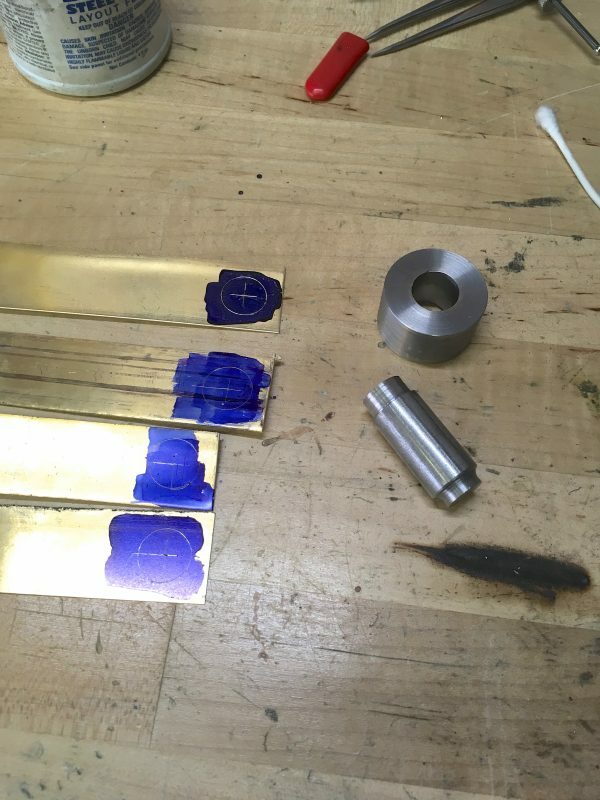 Second, I gave up on cutting nice brass strips, and simply ordered 1″ wide material. It felt like cheating, but the result is much nicer. Finally, I gave up on my homemade punch, since getting repeatable well-aligned holes with it was proving impossible. 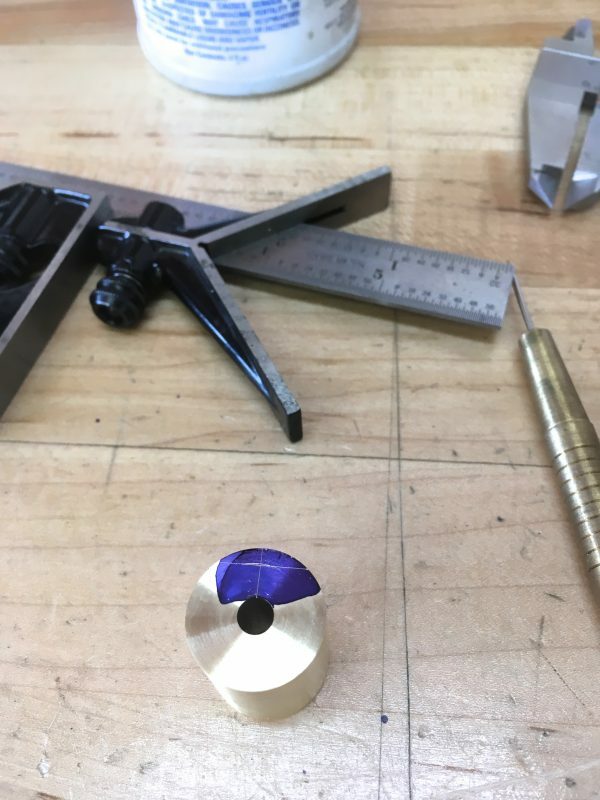 My punch die got a second life as a drill guide. 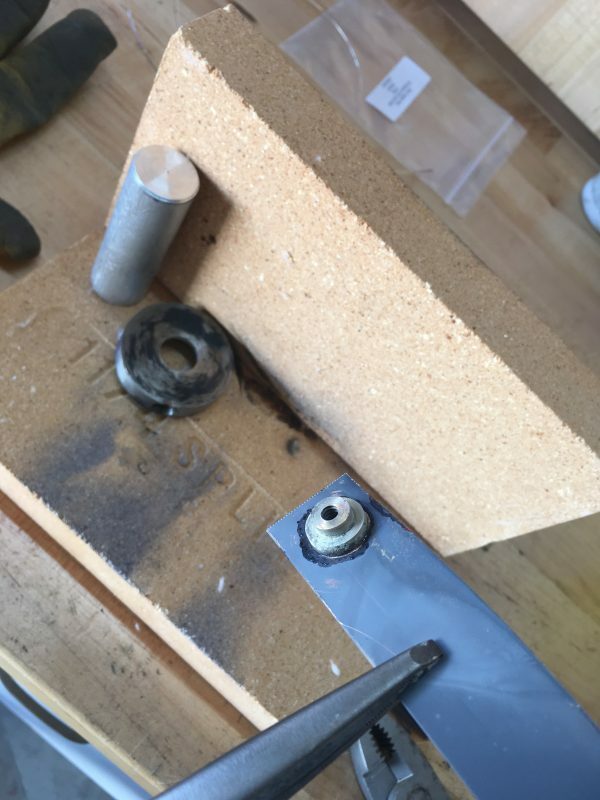 Using it to clamp down the material around the hole and drilling through it, combined with a sacrificial backer, I got perfect easy holes every time. Why didn’t I think of this sooner? This time around, the bottom clamps were measured 48 times and cut once. 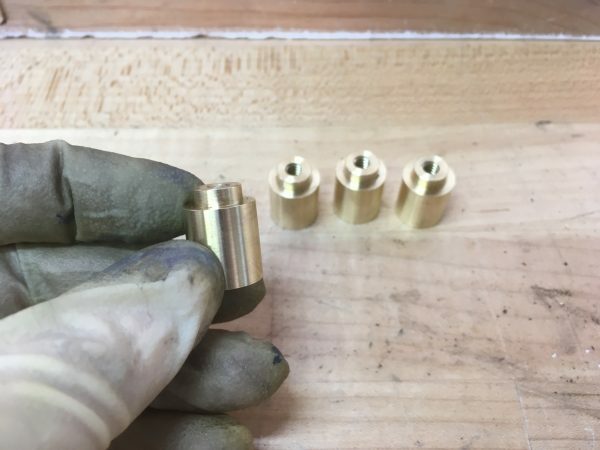 I made some little 10-24 nuts out of brass hex stock for the clamping bolt on the bottom bands. Shazam! That worked beautifully. The top band is solid and both ferrules pass through it. The bottom band is two parts, each with one ferrule passing through. The ferrules screw into the leg bosses to anchor the clamps, and the bottom clamp tightens the boiler upwards against the top band. Here’s another angle showing how the bands overlap and join with the leg mounting bosses. Here are all the parts that make up the leg system, to make it more clear. Once I had a working system, making it again for the other end of the boiler was very very quick. The first set took two weeks to figure out and make. The second set took about 20 minutes. Funny how that goes. Here it is sitting on all four legs for the first time. This was a very fine moment after a long and frustrating road trying to make this work. 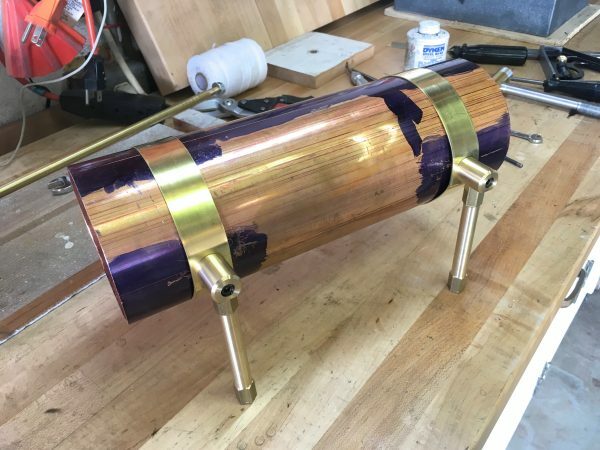 The final step was to attach the legs to a brass plate. This plate serves to stiffen the whole leg system, and also protects the eventual wooden base under the boiler plant from the heat. The band clamps tend to want to pull the feet outwards, which is good. They’ll get pulled inward by the base plate, putting the whole system in tension (and thus making it rigid). I pulled the feet inward with some string until everything was square, then measured that to know how to drill my holes in the base. I could not be more pleased with how this leg system turned out. While it was a painful process, the end result was all the more satisfying for it. Now we can get started making plumbing fittings and all the other bits and bobs that will make this empty shell into an actual boiler. Stay tuned! Next page Next post: Renovation! Instead of bosses, could you have used countersunk bolts stuck through the brass plate into the leg holders from the inside? 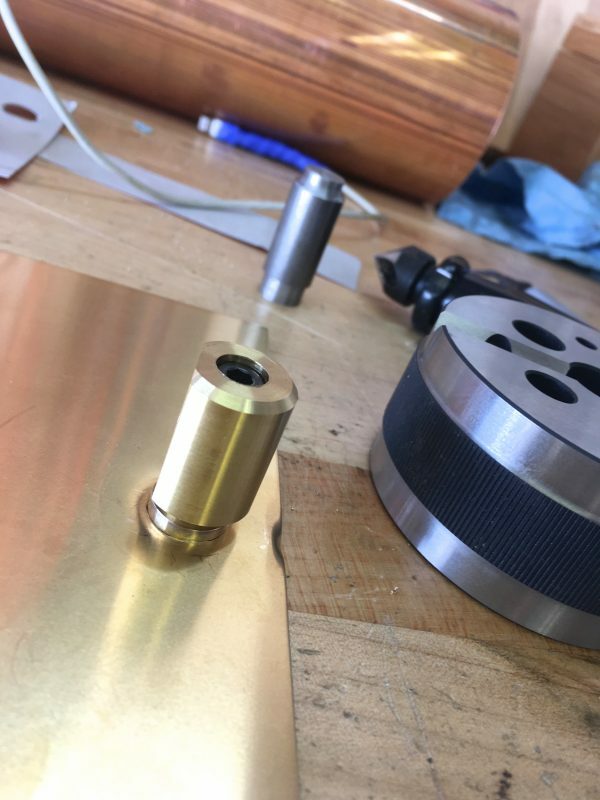 Countersink the leg holders, with extra space for the brass plate, then just let the brass plate bend into the holder by the force of the bolt. That would have given you a flat brass band all around the boiler. I think you’ll need to draw me a diagram of what you have in mind there? 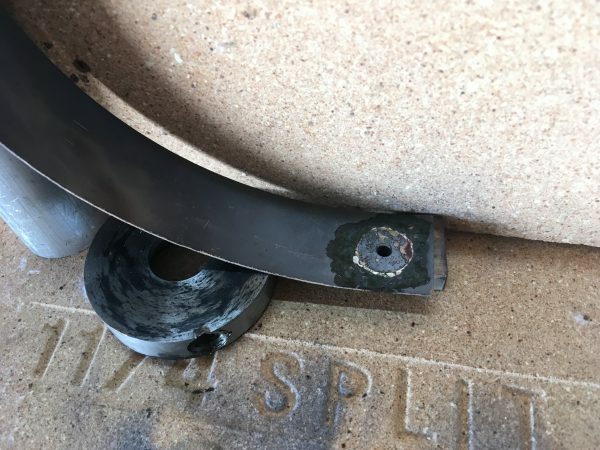 The leg holder is countersunk, the bolt goes through a hole in the brass strip, and as you righten the bolt the strip just around the bolt hole bends and is held between bolt and leg holder. The strip ends up flush with the boiler itself. I’m interested in this idea! Unfortunately the image link above didn’t work for me. Would the bolt go through the boiler shell in your setup? Or be threaded just into the clamp? Do you have a suggestion for a place I can upload the image so you can see it? 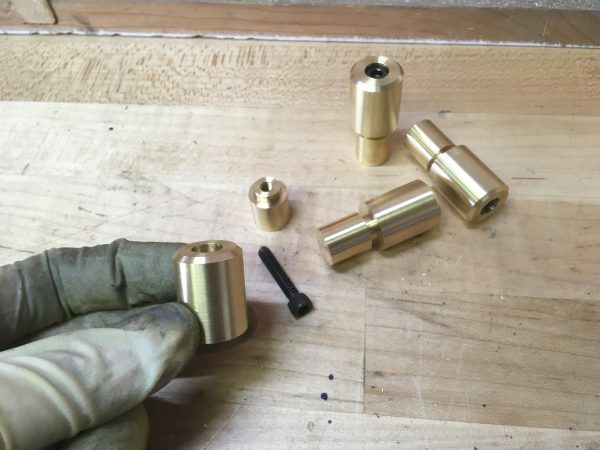 The bolt goes through only the brass strip, from the inside. Then it goes into the leg holder. 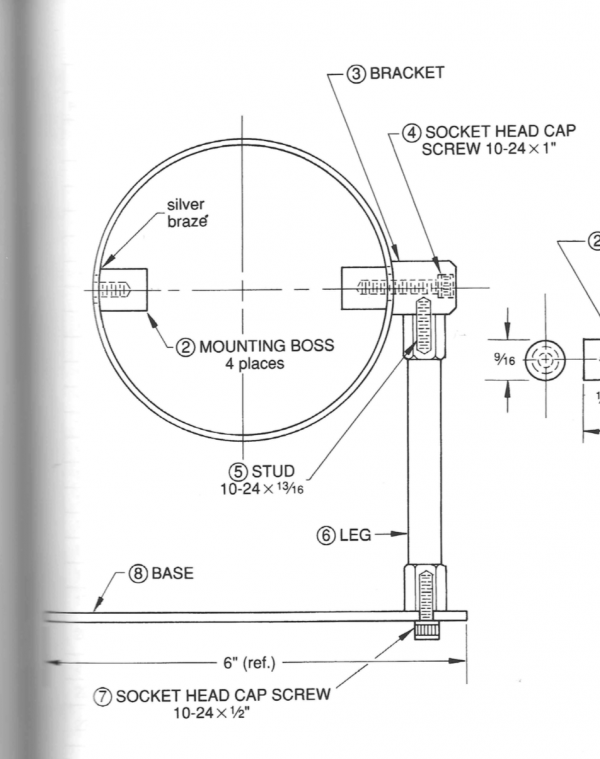 The bolt head is not square, but conical. The bolt holder is countersunk to the same shape, with a bit of extra space. 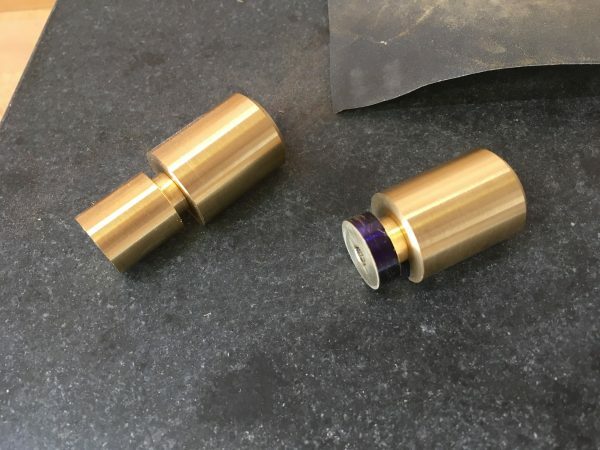 When you tighten the bolt into the leg holder, the malleable brass material around the hole in the brass strip will bend into the holder. When it’s tightened, the brass strip will be held tightly between the bolt and the leg holder. 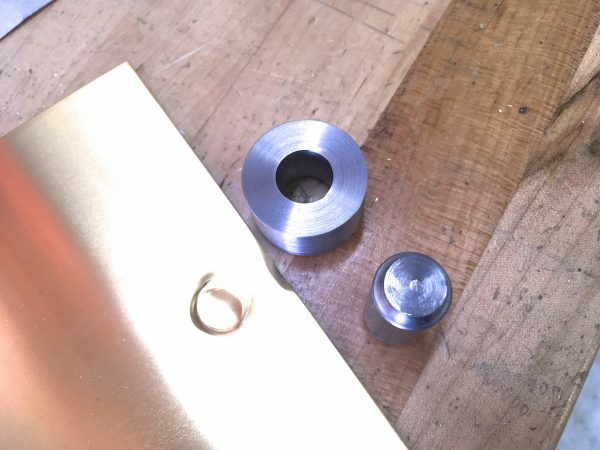 If you were to unscrew the bolt, the brass strip would retain the shape of a cone sticking out from the surface, but truncated with the hole for the bolt. Oh, I see what you mean now! The brass strip is very thin, is the thing. I suspect there wouldn’t be enough material for what you’re describing. It would be worth a try though! Oh yeah, the new legs look niice. Sometimes it takes one rough prototype to help you understand how things really work. I’ve had my fair share of failures that turn into better ideas once you get to hold them in your hands. One thing to keep in mind when designing these legs (supports) is thermal expansion. While the pipe here is very short, there will still be some thermal expansion as everything heats up (depending on steam pressure, I would guess a little under 1/32″). 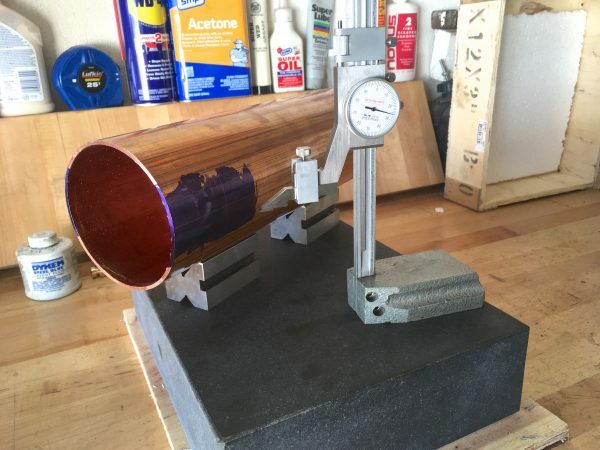 The issue isn’t with the actual thermal expansion, per se, but the force that can generate on fixed supports; even a fairly small expansion can put a decent amount of axial load on the supports. 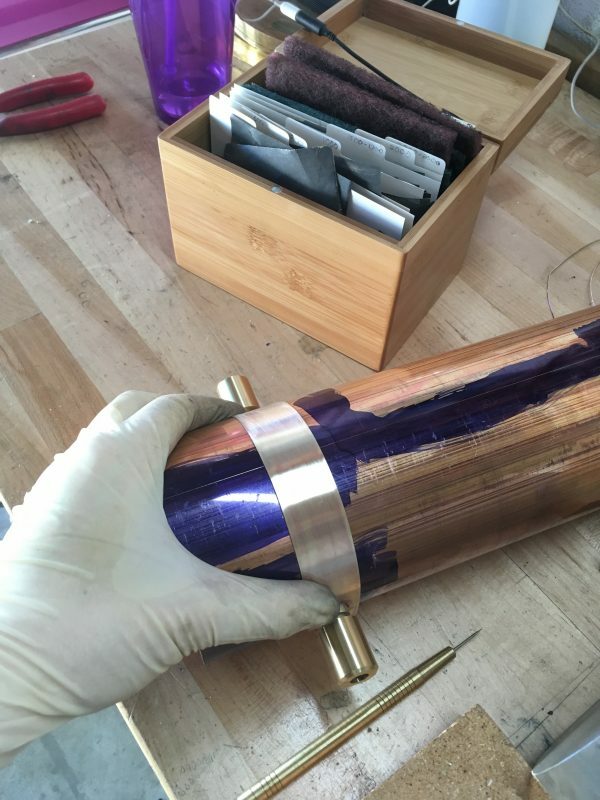 Typically we use roller supports for piping that will experience any decent amount of thermal expansion so that the pipe isn’t too rigidly constrained. 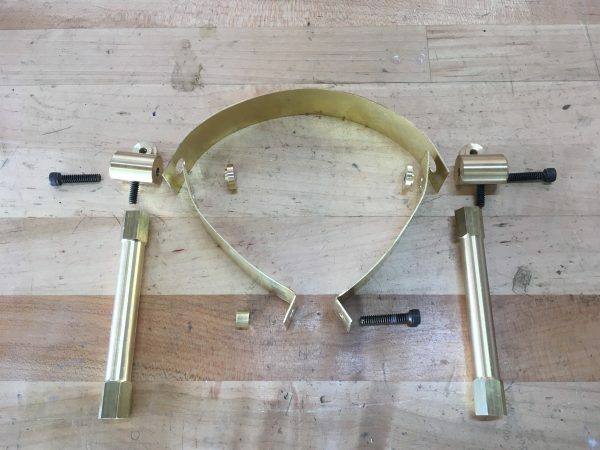 I can’t tell from the pictures if the band clamps you made are so tight as to be an anchor or have some slop to allow for some movement without binding. I spent a lot of time thinking about the thermal properties of this system. 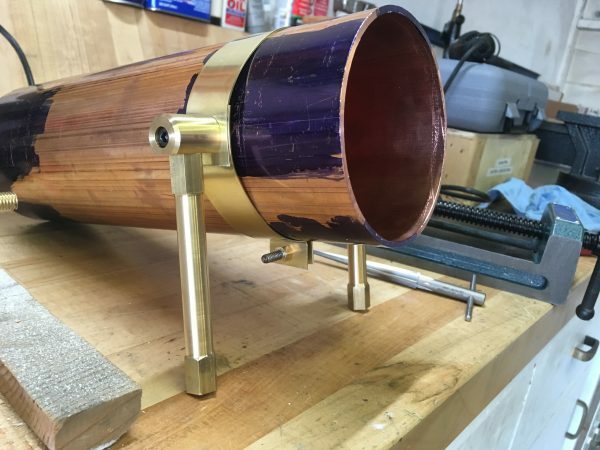 The coefficient of expansion of 360 brass is slightly higher than copper, so I think the band clamp should expand with, or slightly faster than, the boiler. Making some nice progress. Nice that you shared the whole process you went through. The troubleshooting and problem solving thought process is something I always find interesting and it’s a good reminder to not settle for something you’re not happy with. Thanks! Sharing the mis-steps and pivots is important to me here. 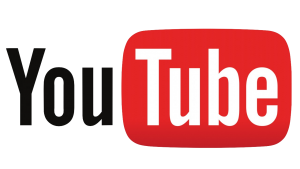 I think the usual format of a highlight-reel-of-success that most people use is less informative and interesting. Nice job sharing the toils and tribulations. But I wonder why you didn’t got with just one band around the pipe, with two holes for the supports, and then the tension part on the bottom? Was your sheet stock not long enough? And I liked the change from punch to drill guide as well, turning the weakness of the drill press into a strength. Very astute question on the single band, and you are exactly right. I couldn’t get stock long enough to do it in one go. 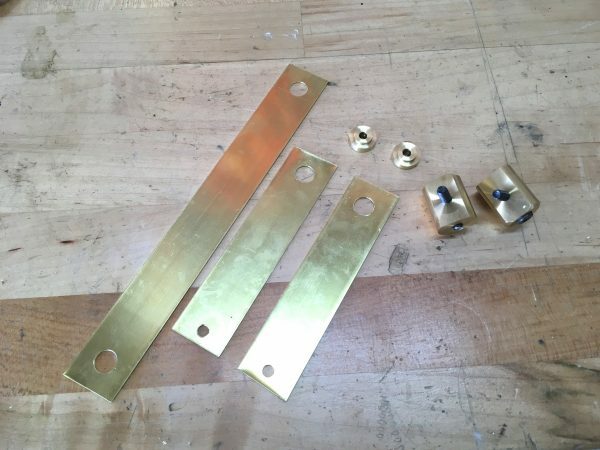 Brass sheet big enough exists in the world, but I was limited by needing 1″ pre-made strips to get nice edges. 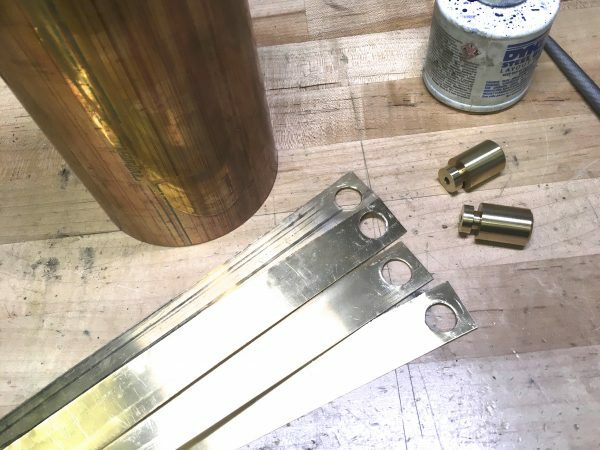 Brass sheet is also rather expensive, and to get long strips, you end up having to buy big sheets and paying for a lot of surface area you don’t need. So even if I had the right tools to make nice strips, I probably would have still gone the two-piece route. You’ve reminded me that I should get around to setting up that PO Box for accepting donations of tooling. 🙂 An arbor press like that would be a fantastic addition here. I am definitely interested in details on the spring-loaded tap guide. 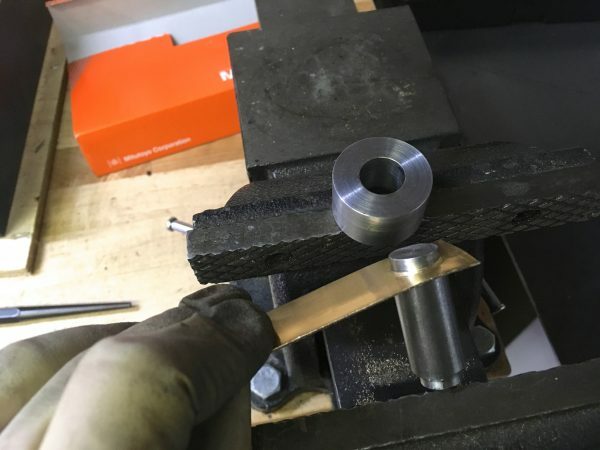 For punches, what I’ve done in the past is to imitate what blacksmiths used to do for hammering symmetric patterns on both sides of a piece of material: they’d make the die halves on arms with a hinge, called a sprung fuller, so they’d be automatically aligned when they closed. There is an issue with them having an arc motion, but if it’s a thin punch that might work. Your post, a while back, on 3d printing a QCTP adapter for a DTI, is one of the most marvelous things I’ve come across. 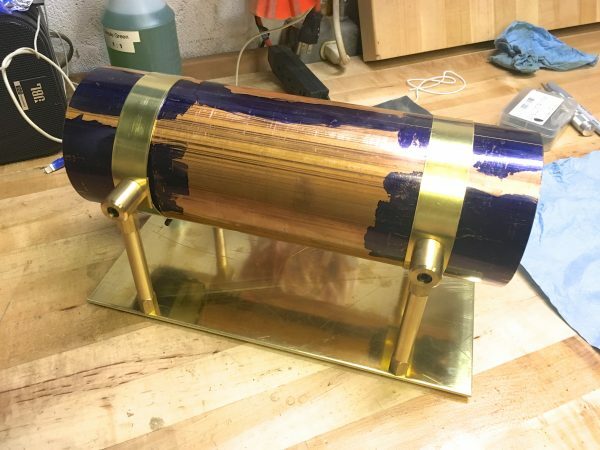 I made one that night, and stuck an old scherr-tumico 0.0001″ DTI in it, and have been going out of my way to use it ever since. Center all the things! That’s great! I actually just made a “2.0” version that lowers the indicator to be closer to on center. It was a bit high for my lathe before. The hinge for a punch is a great idea! I suppose some sort of fixture could be made also, that holds the punch halves aligned with a sliding motion. Would depend on the situation, I guess. Somewhere in the homebuilt aircraft world they have rivet hole transfer punches with the same hinge mechanism, but I cannot at the moment remember why, or what they’re called. 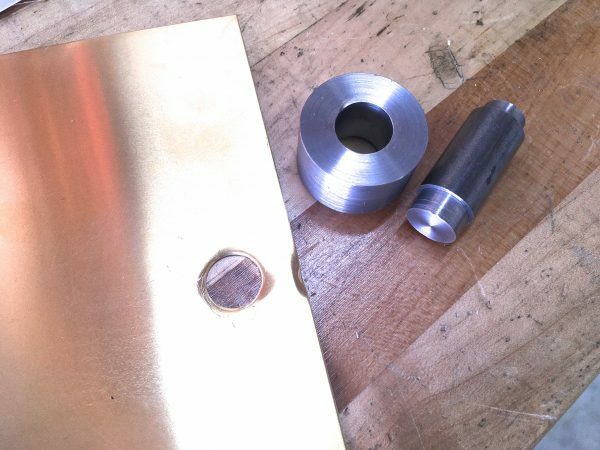 By the way, spiral drills are awful for drilling holes in sheet metal, *particularly* brass, because it’s so grabby. If you can find drills with straight flutes, they don’t grab. I have a bunch for drilling wood veneer (same problem) but they’re just carbon steel. I feel like I’ve seen straight-flute drills in HSS. 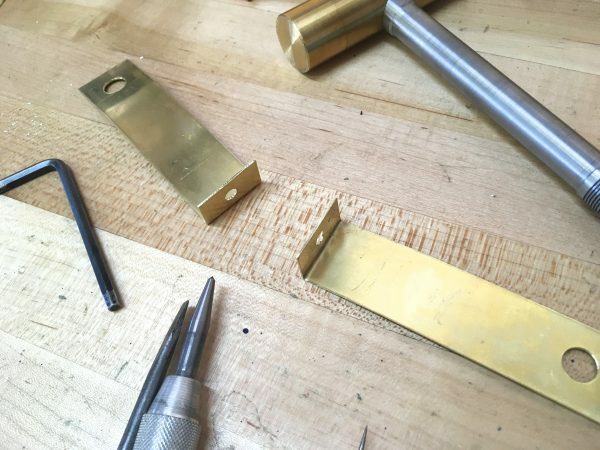 I’ve been told that if you have a really worn out bit, or take a diamond hone to the cutting edges to mangle ’em up a bit, it makes the bit more tractable in brass, but it still scares me. Yup, that’s the truth about spiral drills, but we make do with what we have. 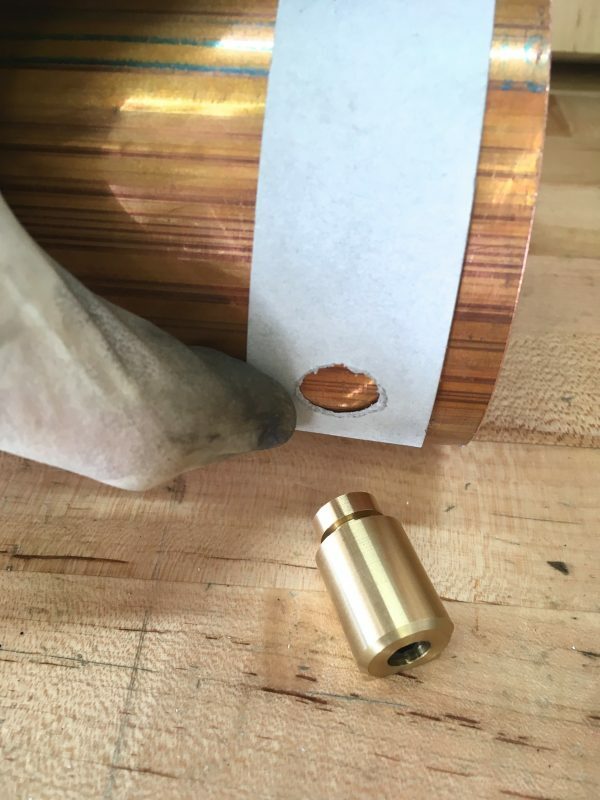 A D-bit or old-fashioned spade-style drill is a better choice for brass. I know a lot of model makers make their own out of drill rod for this purpose. Saves breaking a lot of small bits because they grab and snap so easily. You can also blunt the cutting edges on the bit and regrind at a shallower angle, as long as you don’t need the bit for anything else. 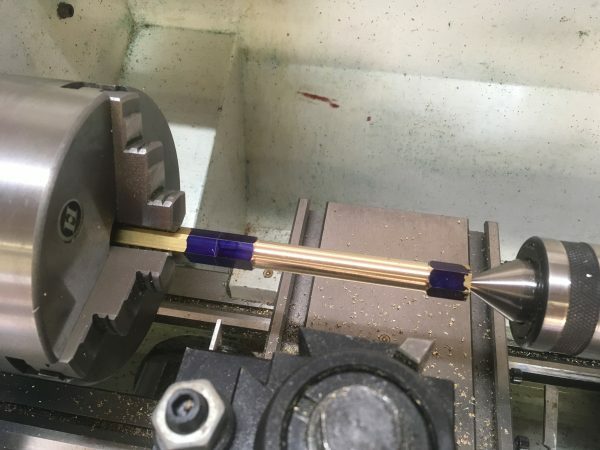 I haven’t tried this yet myself, but it would be nice with the large bits on the lathe. They tend to grab pretty alarmingly when first starting the hole in brass.